Wherever you are, be sure to take along at least one of our eye-catching Mirage Cotton Cap-Sleeve Sleeveless Snap Top - has a slightly longer hemline. These Cap Sleeves are complimentary, while still being cool and comfortable. They have snaps down the front. Subtle colors in distinctive and popular light cotton, it will be the perfect cool top for your tropical vacation this winter. Very generous sizing, S, M, L, XL, 1X, 2X. See size details in Size Selections. 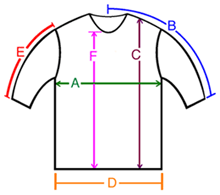 A: Chest / Bust circumference 45-46" 47-48" 49-50" 53-54"
B: Sleeve length from center of neck to end of sleeve 13" 13.5" 14" 15.5"
C: Body length from shoulder to bottom of hem 26" 27" 28" 29"
D: Hem circumference 44" 47" 52" 56"
E: Sleeve length from shoulder to end of sleeve 10" 10" 11" 12"